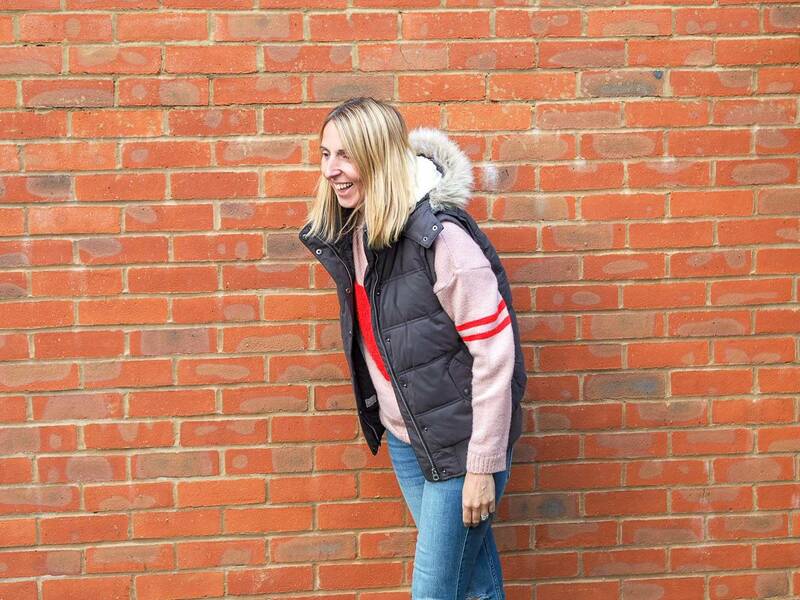 I’ve always loved clothes and whilst I’ve never considered myself to be stylish, I do love clothes and spend a lot of time browsing websites. When I became a Mum, I lost of my way a bit and because I love to dress my girls I spent all my time and money on their clothes. The girls are getting older now and yes I still love to dress them and still spend far too long finding outfits for them. But I felt it was time to be again, to find my new style and to be braver with what I wear. I’m still working on the last part. As we say goodbye to summer, which I’ve been reluctant to do, it’s time to embrace Autumn and get ready for what they are saying is going to be a cold winter. I love jumpers, mainly because I really feel the cold and they keep me warm. But they also make me feel snug and cosy and for me that is what autumn and winter is all about. I’ve never really shared any fashion posts on here before, just a couple with the girls. These are the types of posts that I love to read and I thought I would share with you my 5 jumpers that I’m going to be wearing (a lot). I just love the blush pink that is everywhere at the moment. Our bedroom is blush pink and grey and now my wardrobe is too. 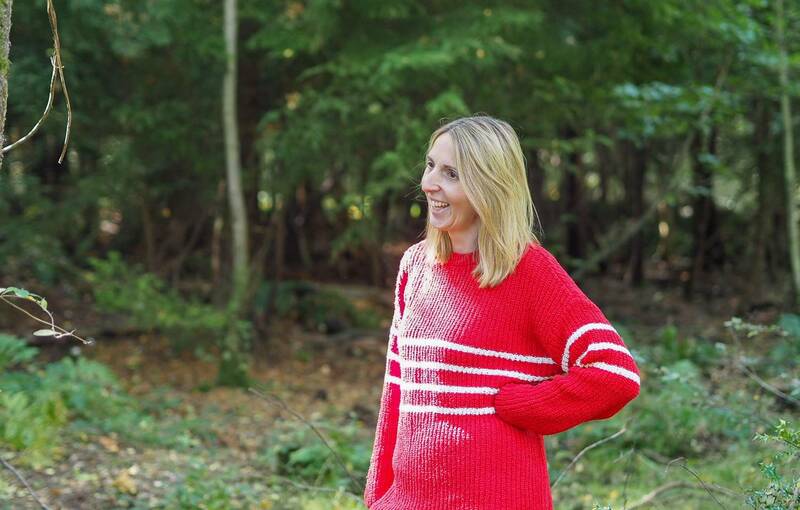 I love a nice thick chunky knit and this one ticks all the boxes. The big red heart on the front, makes it my girls favourite too. It’s from NEXT, who seriously have so many knits that are on my wish list! 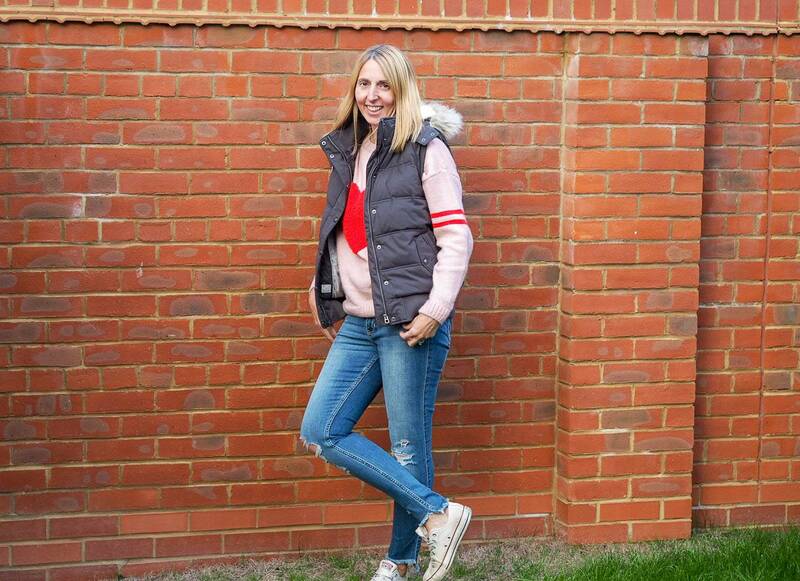 I’m also loving the gilet this Autumn, it is perfect to throw on with my jumpers for the school run or a shopping trip, where you don’t want to be too hot. I really can’t get used to posing for photos and this is what happens after Andy has taken the shot…I probably shouldn’t show you and make out that I’m this cool. But I’m really not and I just feel awkward! I love a rainbow stripe, I mean who doesn’t? And I also love shopping at the supermarket and can’t resist a quick look when I doing my shopping. 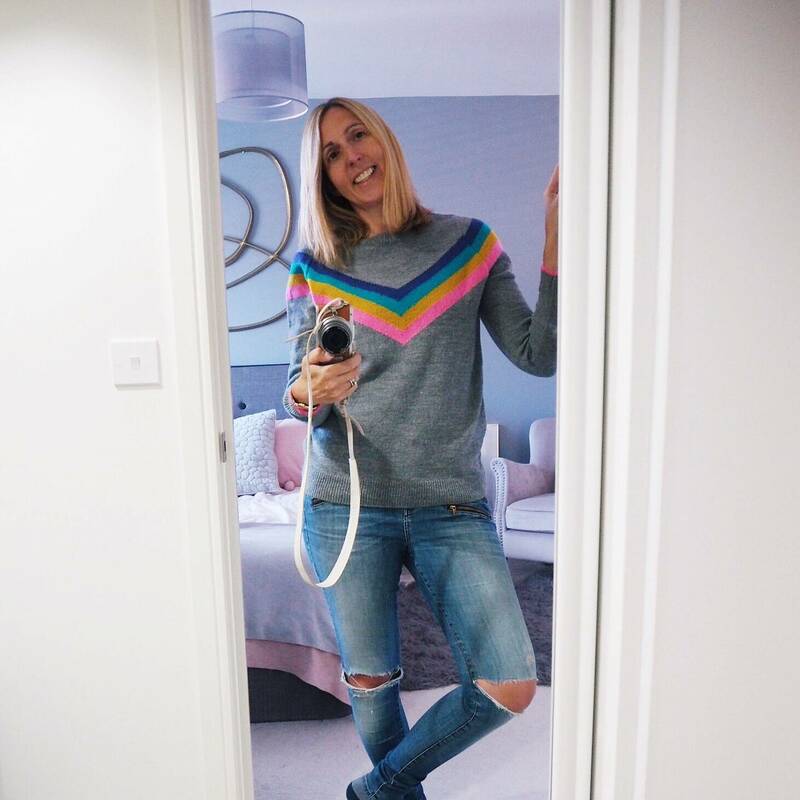 I recently brought this lovely grey jumper with rainbow stripes at Tesco and I love it. It’s really soft and easy to wear. My tip for buying in supermarkets, is buy it when you see it. Especially Tesco as you can’t buy it online. As well as a knit jumper, I love a sweatshirt type too. They are my go to when I feel more in a slouchy, comfy mood if you know what I mean. 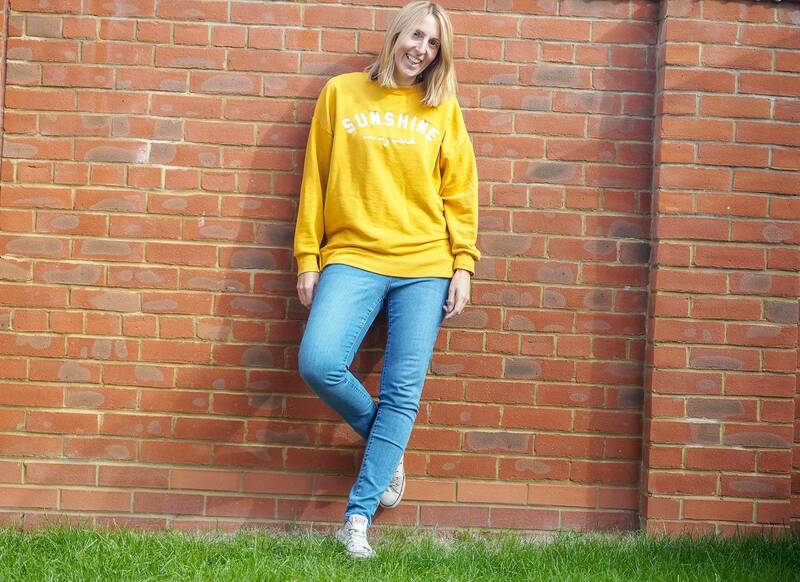 I also love a bit of mustard and this jumper from New Look, just called my name when I saw it in the shops. It’s really baggy and I sized down for it. It’s really comfortable to wear and it’s perfect for midweek slow day or a Sunday when you’re relaxing at home. It says on it ‘Sunshine on my mind’, which is very true. I did warn you that I love pink and this jumper is SO soft. I love the eyelash detail across the front and it’s really snug. It is from Matalan and they are have a great range of knitwear this year. I’ve been trying to push my style more and not always reach for my trusty jeans. I brought this skirt a while ago from ASOS and when it’s a bit warmer its great to team with a jumper and trainers. I don’t wear much red, it’s a very bold colour and I’m all about blending in. But as I’m trying to be braver and bolder with my style and I saw this jumper which I loved, I didn’t let the colour stop me buy it. I probably could’ve gone for a smaller size, but I love how comfortable it is and its going to keep me really warm in the winter. It is from NEXT and as I mentioned above their knitwear is brilliant this year. This is what is going to be keeping me warm this autumn and winter and whilst I will always be a summer girl. I do love being snug and warm in a jumper. Previous Post: « Our 2018 Family Bucket List…October Update! Lovely post Laura and great to see some photos of you. The bright coloured jumpers are fab, I might have to invest in one for this year. I definitely need to start looking into jumpers. I love the sweatshirt ones, they are so comfy! Oh I’m loving all your picks but my fave is the pink heart jumper.